Another grotty day in Paradise – At the age of 52, Peter Inson found himself teaching in Switzerland and learnt to ski. Four years later he met a former world downhill champion who took him out for a morning on their local mountain. We are on the chair-lift on the Horneggli, a popular mountain above Gstaad in Switzerland. It’s snowing very gently but the visibility is good and the piste is excellent. We are enjoying our skiing. My companion grins; “Another grotty day in Paradise.” Bruno Kernen, the former world downhill ski champion, is giving me a morning’s ski lesson. We laugh and get off the lift for our last run. Rugby, riding, running and social cricket from time to time, but never skiing: too far away from home and too complicated for occasional pleasures. So what am I doing, trying to improve my skiing now, in my late fifties? Before we start Bruno watches me slip the pole straps over my hands. He shakes his head and steps over. “Like this so that you can’t lose the poles and so they can’t be knocked out of your hands. Let the other skiers see that you are a pro.” He laughs. It makes sense. But there is no comment about my skis or other items of equipment: ex-rental boots and second-hand skis. Perhaps you don’t have to spend a fortune on kit. On the first run Bruno waits two hundred yards below and watches me ski down to him. From one side his ten year-old son, Jan, casts a critical eye. Posture, that of a boxer or a front-row forward. Now then, poles, like this, uphill ski slightly forward, turn rather than slide. Hands in front of the bindings. We set off again. In 1999 I came to Switzerland to teach at Le Rosey, a school that has a winter sports programme. Skiing was now conveniently on my doorstep – last year I managed a run of thirty consecutive days. At fifty-two I learnt the basics with a group of teenagers and trudged around, uncomfortably and clumsily, as is the lot of middle age. Colleagues helped patiently and told me to make sure I turned up every day for the first ten lessons. A month later I stood in line with the kids I taught in school while an examiner put us through our paces. It certainly feels much easier. We move on. The piste narrows here and there is a lot of loose snow. A month earlier, a skiing friend had spent a fortnight in Bruno’s hotel, the Bahnhoff in Schonried. 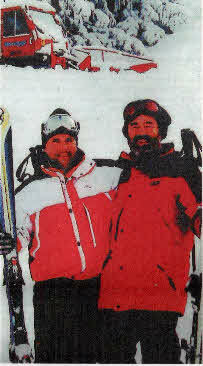 Bruno is an excellent host and Ken introduced me as an English teacher who had learnt to ski at an advanced age. Bruno joked that he would exchange ski instruction for English lessons and we shook on the deal – as you do. We met again the following week and I soon discovered that Bruno meant business; a date was agreed. I could not believe my luck. Round, onto the moguls and we stop. “Stay as you are. Just hold out your poles.” Bruno is immediately below me. Jan looks on. “Try to stay where you are.” He tugs on the poles and down I go. “Now, try and position yourself like this.” He shows me; knees and rear towards the mountain, then he pulls again on my poles. I don’t budge. It is so clear; I feel it in the legs and understood it in the head. “You can’t defy gravity!” He laughs and we ski on. Then he was taken into the Swiss ski squad in 1978 and the World Championship followed in 1982. In the squad there was more to learn. A bad injury to a knee and an elbow confined him to plaster for three weeks and he was sidelined. Left to his own devices by team doctors and coaches he learnt to toughen himself and get himself back into form. He had learnt not to rely on others. This time we are on the black piste, turning wide turns, as many as we can fit in. I fly past the spot where loose snow had pulled me down the day before – it’s getting better already. Bruno demonstrates my continuing stiffness and I grin with embarrassment. He sends me down in front. I’m a pupil again, wondering what the teacher will say when he’s caught up with me. The snow continues and there is no sign of anyone else – Jan has returned home, bored, for my skiing has not held his interest for long. Bruno and I have the mountain to ourselves and he watches me skiing more easily; over an hour now and not so much as a twinge in the legs. We sit back on the lift again and look over to the moguls – a solitary figure moves across and drops below us. His approach to the moguls is faster this time and I try to imitate his long easy turn. I fight to stay upright and judder to a halt. Bruno smiles. “You know what you do wrong.” I nod. No contra-rotation and I’m back in the loose – the scrum somewhere on a rugby field, not in the snow. I’m fighting to stay upright, but there’s no ball to hang onto and my poles were nowhere near the right place. “You have to dance. Watch me.” Back down the red and it’s easier. I can sense some rhythm now. Back at the top. “I would like to invite you for a drink.” We make our way into the old wooden building. The midday punters have yet to arrive and the staff are having a break. I realise that they are wearing shirts embroidered with Bruno’s name. “Grussi Bruno.” Smiles are exchanged – they seem genuinely happy to see the boss. Over coffee we watch a giant slalom on the television – already it makes more sense. A friend of his joins us and there is a brief conversation in Swiss German. I am introduced and the friend climbs onto the rough wooden wall of the restaurant to demonstrate his version of gravity, for rock climbers. It’s all physics apparently. Advance the top ski, move your hips and knees towards the mountain, plant your poles and take the weight off the inner ski, throw your chest out to show that you control your skis, rise and fall as you turn – if you stay down you will simply exercise your leg muscles and lose your reserve control – keep your shoulders back, face down the slope, hands in front of your bindings, feel each piece of snow through your feet and your knees and look further ahead. Bruno grins, an infectious grin. He’s enjoying himself. “I can’t make you into a champion in two hours, but now you know what to do when you practise on your own.” He’s still smiling, even after two hours of baby-minding. I pause for a moment’s thought and realise that my enjoyment of the sport so far has involved skiing at the limit of my control. What Bruno has made me realise is that there is much I can still do with my skiing, an enjoyable way to make further progress. Down at the bottom we shake hands and walk back to our work. There are English essays to correct and it will soon be lunchtime in the Hotel Bahnhoff. I make it clear that I have had an unbelievable morning and thank him for tolerating an old codger. Bruno smiles reassuringly; I have not been wasting his time. “You see, I don’t want to ski with restaurant guides.” He explains. “People who make their way from one bar to the next. I’m happy with people who really enjoy skiing.” Twenty years on, Bruno still means business on the slopes and I have had some incredible instruction. Next morning my time down the black is reduced from four minutes to three.